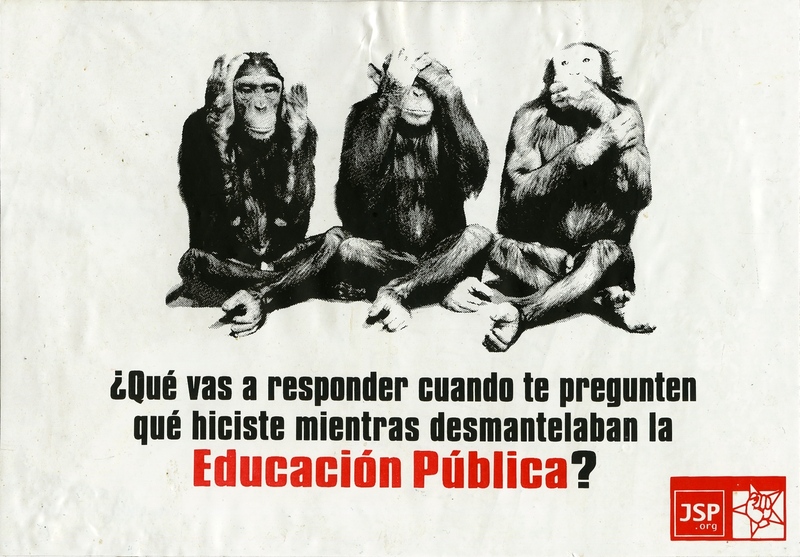 ¿Qué Vas A Responder Cuando Te Pregunten Qué Hiciste Mientras Desmantelaban La Educación Pública? How Will You Respond When They Ask You What You Did While They Dismantled Public Education? The sticker contains the symbolic image of The Three Wise Monkeys, otherwise know as: Hear No Evil, Speak No Evil, Say No Evil. "In Western societies it has come to mean that - in certain settings it may be wise to look away, fake ignorance or refuse to recognize questionable, illegal or immoral behavior." In the context of this sticker, the monkeys refer to the way the public is responding to education cuts. Its is getting at the idea of whether or not the people should sit back faking ignorance as the government makes more cuts or if the people should take a stance and fight back for their rights.